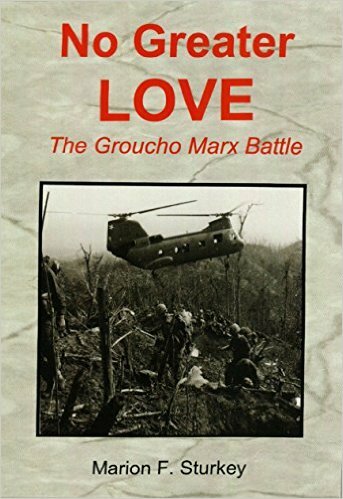 A four-man U.S. Marine Corps “Groucho Marx” reconnaissance team and an infantry platoon became stranded on a tiny jungle knoll in faraway Vietnam. Surrounded and outnumbered over ten-to-one, Marines fought attacking North Vietnamese Army soldiers throughout the night of August 8, 1966. They sustained 36 casualties before the rising sun ended the night of horror. Only a single handful had not been killed or wounded. Against vastly overwhelming odds this struggle to survive exemplified the warrior ethos of the Marine Corps. Loyalty to brothers-in-arms never faded. Infantrymen and helicopter crews shared the sacred bond, the trust, the love, the passion, the incommunicable experience of Marines at war. Brotherly love and loyalty were the glue that held the young Marines together. Their love could not be shattered by passing years, or social status, or misfortune, or declining health, or by anything other than death. There is “no greater love.” The author is a Marine Corps veteran who fought – and bled – at the knoll that night. He used exhaustive research, interviews, and hundreds of military and civil records to create this riveting and mesmerizing true saga.